A popular question around here is, "what do I make with lemon curd? how do I use it up?". Well, I'm here to share with you yet another delicious use for curd...piled on top of this Lemon Cake. Yu-uh-mmy. Add some homemade whipped cream and berries and you're good to go. Don't forget to be generous with the curd! Somehow guests can never get enough...husbands too. What I love about this dessert is that it's a fruit-based dessert you can enjoy in the wintertime...since the height of citrus season is right about now. I made lemon curd last Easter based on your recommendation and it was AMAZING! I still can't believe how easy it was. Uh oh...now I'm craving some! 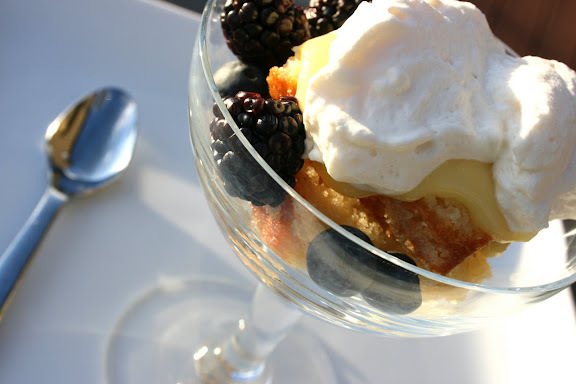 ...that reminds me I jst mentioned you on my blog as something "i love..."
Pound cake trifle is really good with lemon curd and lots and lots of berries (strawberry, raspberry, and blueberry all together are great) when they're in season. Okay, you have to stop posting such fantastic looking desserts. I'm pregnant here and ready to dive into my screen to your lemon cake post. Thanks for another wonderful recipe recommendation; I'll have to try this. I'd like some of that. Yes, please.